Rabid foxes often lose natural fear of humans. Avoid contact. Rabies is caused by a virus spread in the saliva of infected animals. All warm-blooded mammals can be infected. 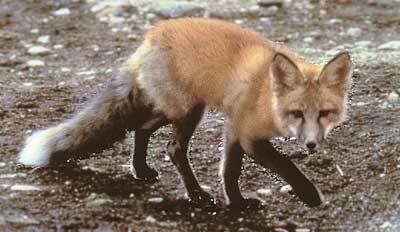 In Alaska, rabies occurs most often in arctic fox and red fox from the North coast, West coast and Alaska Peninsula. Rabies has also been found in dogs, red foxes, wolves, caribou, and polar bears. Humans can also get rabies. Rabid animals often lose their fear of humans and may become vicious and attack for no reason. They may have a dropped jaw and appear to be "foaming at the mouth." Rabid animals may appear weak or paralyzed. They also sometimes chew rocks, dog chains, and other non-food items. You can get rabies if you are bitten or licked by an infected animal or if saliva from an infected animal comes into contact with your skin, eyes, nose, lips, cuts or scratches. Rabies can be fatal for humans and signs may be undetectable for weeks or months. Do not go near an animal that you think has rabies. Any person exposed to an animal that may have rabies should immediately contact the local nursing station or hospital. Report any animals suspected of having rabies to the nearest ADF&G biologist or the Virology/Rabies Unit in Fairbanks (371-1000). Afterhours rabies line is 855-371-1001. If you must kill an animal that you think has rabies, do not shoot it in the head. There are also vaccines against rabies for humans. If you are in a high-risk area or profession (e.g., trapping), contact your health aide or hospital about getting a rabies vaccination. Do not eat meat from an animal that has rabies. Do not feed the meat to dogs. Do not collect samples yourself. For foxes, double-bag the entire animal in strong plastic garbage bags and put in a leak-proof container. Contact the nearest Fish and Game office or the Virology Unit in Fairbanks. Frozen specimens are okay. For larger animals, do not cut into carcasses suspected of being rabid.